I grew up in the beautiful province of B.C.,Canada where I was privileged to spend many summers in the interior and northern interior sections of this amazing province. The scenery is stunning and so very unique. What a fantastic way to spend the summers of ones youth. As long as I can remember the month of August would have forest fires in many areas and there would be warnings and notices as to where it was safe or not safe to hike and camp etc. As someone who loves hiking in isolated areas it was very important to be informed about forest fires. Sadly I started noticing over the years that the fires were starting earlier in the year, lasting longer and covering a much larger area. According to scientists this is a direct result of global warming and climate change. So when I thought about writing a piece of music to describe some of the problems caused by global warming I naturally thought about the forest fires I had grown up with and how they were appearing with greater frequency, were harder to contain, and harder to put out. A couple of times when I was overly close to a couple of forest fires I noticed how the sky would appear to be on fire and the sun would disappear behind the smoke of the fire. It seemed like the earth itself was on fire and like the sun had died and all that was left were the flames and smoke. This piece of music is my attempt at musically describing what I saw. 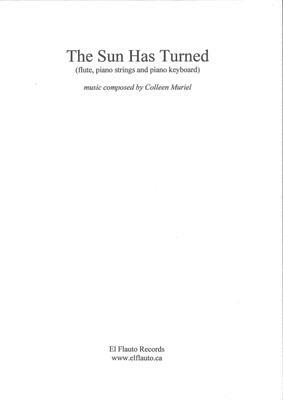 The Sun Has Turned (flute, piano strings and piano [1 or 2 pianos]) is approximately 2 - 3 minutes in length and written for three musicians. When only one piano is used the pedal markings for the piano strings are to be observed. When there are two pianos each piano is to observe the pedal markings indicated for that particular piano. There are two copies of the score in this book. One has one system per page and the other two systems per page. Musicians can choose which score or mixture of scores works for them. It is important to note that there is a point in the music where there are two options. The musicians are to pick either Option 1 or Option 2 (not both). Option 1 is found on pages 14-16 and Option 2 on pages 17-19. Options 1 and 2 are on the same page. Option 1 is found in lines 20-22 and Option 2 in lines 23-25. Accidentals apply only to the note they directly precede. The piano string glissandos are to be played slowly (except where indicated otherwise) either in a straight line or circular manner with the fingers creating an ethereal quality. What do you want to know about The Sun Has Turned ?